Almost two millennia ago, Roman Emperor Nero watched Rome burn. While legend has it, as fires raged, he gleefully played the fiddle, historians believe the claim bogus. What is not bogus, however, is Nero used the incident to further his own political agenda. His agenda included clamping down on Christian influence. By blaming Christians for fires that damaged or destroyed ten of Rome’s 14 districts, Nero created a pretext to arrest, torture and execute hundreds. 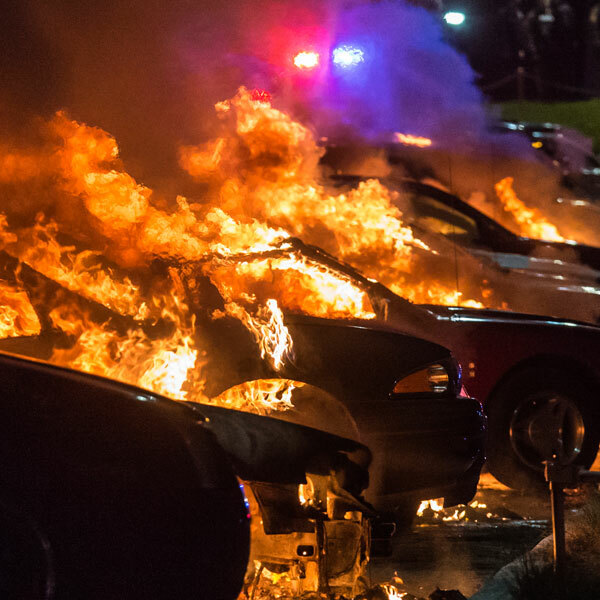 America’s modern day Nero, President Barack Obama, opted to play golf as fires in Milwaukee, Wisconsin, raged in the wake of riots sparked by the August 13 police shooting of Sylville Smith, 23. The crowds’ chants threatening violence, and then making good on it, apparently insufficiently concerned Obama to interrupt his game to appeal to rioters to refrain from such activities. Such indifference makes one wonder what Obama’s own political agenda may be. The Milwaukee riots could not provide a clearer example of rioting for the wrong reason-thus giving rise to the need Obama speak to the violence. Smith, who was African-American, had a long rap sheet for crimes “including robbery, carrying a concealed weapon, theft, possession of heroin, possession of cocaine and even witness intimidation.” Facebook photos show him menacingly pointing a gun, both alone and with others. After being pulled over in a traffic stop, Smith took off running; a foot chase with a police officer ensued; the officer encountered Smith in a fenced-in yard; Smith turned toward the officer with a gun in hand (later determined as stolen and containing 23 rounds); despite a police command to drop the weapon, Smith raised the gun; the officer fired, striking Smith twice, mortally wounding him. What is of importance to note too is the officer involved was also African-American. As a fellow African-American, it is doubtful the officer was thinking about anything other than his own personal safety-safety that was clearly put at risk by Smith’s actions. Assuming the circumstances concerning Smith’s shooting detailed above are all correct, which Milwaukee Police Chief Edward Flynn reports as such based on the soon-to-be-released film footage taken from the officer’s body camera, an important question arises: If deadly force was not warranted in this case, when is it ever warranted so as not to cause similar rioting? What is most telling about the circumstances of Smith’s demise is what his father has said in the aftermath of his son’s death. The senior Smith admitted his own responsibility for his son’s criminal life. Blaming a criminal culture based on drugs and guns, the father pleaded for the black community to “wake up” to see what is going on. Yet, who is it that is targeted by rioters in Milwaukee in the aftermath of a black-officer-on-black-victim shooting and of a black father’s admission he was a bad role model for his dead son’s violent life? Rioters have targeted whites for “beat downs” and their businesses for destruction. Where lies the logic for blacks to so target whites? FBI statistics showed blacks disproportionately suffering violence in 2012 at the hands of fellow blacks than at the hands of whites-and whites twice as likely to be murdered by blacks than by whites. Those statistics also show that year while there were 200 mostly justified police killings of blacks, there were more than 6,000 black-on-black murders. In black communities, 72 percent of black children are born to unwed mothers-giving rise to numerous societal ills. As one critic queries, have whites forced blacks to have babies out of wedlock? Rioters such as these suffer from “kick-the-dog-syndrome“-their aggression causing them to lash out at an innocent target. Not wanting to take responsibility for self-inflicted social wounds, the focus shifts to an easier target. This is displaced aggression at its worst. As happened to Christians in Nero’s time when Rome burned, whites in Milwaukee have now become a 21st century equivalent-an unrelated incident being allowed to become a pretext for displaced aggression against them. And what does our modern day Nero have to say about this? Nothing. Absolutely nothing! As whites continue to be targeted by blacks, Obama should be praising the honesty of the comments made by Smith senior about the true cause of so many of the social ills the black community suffers. Obama should be sending a message to the black community, as did Smith’s father and as race baiters Jesse Jackson and Al Sharpton refuse to do, to look inward-at the drug and gun culture-and to marital irresponsibility as the causes of their ills rather than to look outward for a scapegoat. Obama’s refusal to do so-instead choosing to go play golf as whites are beaten down and their businesses burned-leaves one wondering about his own political agenda. Could it be his silence, at a time Obama should be speaking out, is indicative of his own deep, dark racism against whites-ironically, the same whites whose votes he twice sought and needed, but no longer does, to be elected?